The raw milk business has long been a flashpoint. But newly released government figures on health concerns over the unpasteurized product as well as the prospect of more foodborne illness litigation presents potentially greater challenges for sellers as more people drink it and more states ease restrictions. Pulled along by the trend toward organic and whole foods, milk straight from the cow has caught on even as public health officials, backed by big dairy trade associations, have increasingly warned of its dangers especially to young children and other vulnerable populations. In fact, according to the just-released data from the U.S. Centers for Disease Control and Prevention, unpasteurized milk and cheeses are estimated to cause, on average, virtually all of the 761 illnesses and 22 hospitalizations annually linked to all dairy product outbreaks in the U.S. Despite such alarming numbers, various forms of untreated milk sales are now legal in 42 states with more considering allowing consumers to buy it. And the estimated 10 million raw milk drinkers in the U.S. are buoyed by a number of farm-to-fork advocacy groups that tout local and minimally processed foods. Morrell also said she thinks the government’s illness numbers are skewed and that they don’t account for raw milk’s many health benefits.If Morrell’s thinking continues to catch on, and more people turn toward raw milk and away from its pasteurized form, the specter of people getting sick in greater numbers is a certainty, the CDC and other health officials say. And along with these additional illnesses will come more litigation which can pose serious threats to raw milk sellers’ business, nationally recognized attorneys at the center of the issue told BNA. “People assume that if it’s healthier, it’s safer, but it’s not,” said plaintiff lawyer Fred Pritzker, of Pritzker Hageman in Minneapolis, who focuses on foodborne illness litigation. Smaller dairies with fewer assets and insurance appear most vulnerable if they lose even one case. Producers of raw milk for direct sale to consumers have tangled with the federal government for years over health risks. Their product from cows, sheep, or goats is not pasteurized, or heated, to reduce dangerous bacteria. It can carry a host of harmful microorganisms linked to foodborne illnesses.Consumers are 840 times more likely to get sick and 45 times more likely to be hospitalized from consuming unpasteurized dairy compared with pasteurized products, according to latest CDC data released in June. That’s up significantly from CDC research covering more than a dozen years and ending in 2006. Sickness can be fatal and warnings are underscored for children and for those who are pregnant.“In the last 10 or so years, we’ve seen an increase in illness outbreaks from raw milk, and some of that is related to its increased popularity,” Michele Jay-Russell, a microbiologist at the Western Center for Food Safety at the University of California-Davis, said.“It follows along with the general movement of local and natural foods, and a pushback against factory farms, as they’re called, and wanting unprocessed foods,” she said. The CDC also cited relaxed regulations at the state level that permit greater access to unpasteurized products, and warned that outbreaks—including those caused by campylobacter, E. coli, listeria, and salmonella—will climb. 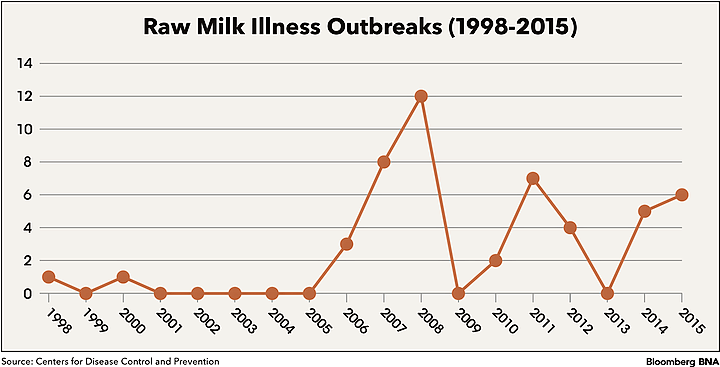 “As consumption of unpasteurized dairy products grows, illnesses will increase steadily; a doubling in the consumption of unpasteurized milk or cheese could increase outbreak-related illnesses by 96 percent,” the CDC said. Outbreaks are both national and international.A campylobacter outbreak traced to raw milk sickened as many as 65 people in the United Kingdom last year. The farm, using a “From Moo to You” slogan, offered ready-to-drink untreated milk for sale in a vending machine.More recently, health officials in Washington state temporarily suspended raw milk sales at two dairies in February after a foodborne illness investigation revealed E. coli contamination in raw milk. An emerging foodborne pathogen—a strain of E. coli bacteria known as Shiga toxin-producing Escherichia coli 0157:H7—is increasingly sickening people, particularly children, Jay-Russell said.Raw milk advocates say the CDC “cherry-picks” its outbreak data and fails to acknowledge the product’s benefits, which they say can counteract asthma and other health problems. “There’s no sensible discussion about this, or discussion that looks at the benefits,” said Morrell, of the Price Foundation.Jay-Russell, of the University of California-Davis, said of some European studies that there’s “some reasonable evidence” there could be a component of raw milk that may “have an effect” in reduced allergies.“But the findings fall in line with other studies showing that children have less allergies if they live with a dog or a pet, or live around livestock on a farm,” she said.“The one thing you’ll find in these European studies is that raw milk is still too dangerous to recommend, especially for children, because of the potential for contamination with pathogens,” Jay-Russell said. The road to litigation can begin when a farm seeks income by selling raw milk to local consumers, rather than to a distributor. But for these farmers and producers, some of whom struggle with conventional commodity prices to make business ends meet, the margins can seem hefty enough to warrant the risk of bypassing the middleman. “We get $12-a-gallon for our raw dairy,” said Morrell, who operates a farm in Maryland. “If I was selling into the system, I would get $1.30 a gallon.”But watch out. That extra income can pale in comparison to the potentially millions of dollars in damages that might have to be paid out when foodborne illness lawyers come knocking. William Marler, a noted food safety litigator with Marler Clark in Seattle, recounted a case he handled in 2008 in which a girl was seriously sickened by raw milk produced by a Connecticut dairy and sold at a Whole Foods Market. “The farmer had a million dollars of insurance, which wasn’t remotely enough to deal with it,” said Marler, who has decades of experience in food safety litigation. The farm tendered the policy, went bankrupt, and Whole Foods settled related claims, Marler said. “I proceeded against the retailer, and the retailer has responsibility for a product like raw milk,” he said. Whole Foods Market, Inc. didn’t reply to requests for comment about the Connecticut case.Pritzker, the other plaintiffs’ attorney, said a case he once settled in Pittsburgh “for a lot of money” involved a woman who bought raw milk for her unsuspecting husband. “She had heard good things about it, and this guy had no knowledge,” he said. “It was a bottle of milk in the refrigerator and he drank from it” and got sick, Pritzker said. Federal law bars the interstate sale of unpasteurized milk, but states retain the power to legalize and regulate sales within their borders. And illness reports haven’t stopped raw milk advocates from gaining the ear of state legislators.Only eight states ban outright the sale of milk that hasn’t been treated to destroy harmful pathogens. Many others permit direct-to-consumer purchases at farms, through cow-sharing agreements, or retail sales.And at least 10 state houses are considering bills this spring that would legalize raw milk sales or expand existing options for farmers. They include Alaska, Hawaii, Illinois, Iowa, Massachusetts, Montana, New Jersey, North Dakota, Rhode Island, and Texas.“There’s an organized movement to pressure state legislators to relax these laws,” Christopher Galen, a spokesman for the National Milk Producers Federation trade group, said. Galen’s organization represents cooperatives that produce the majority of the U.S. milk supply, and is “the voice of dairy producers on Capitol Hill and with government agencies,” according to its website. The producers federation and another trade organization, the International Dairy Foods Association, oppose such state laws. They argue consumption of raw milk “is a demonstrated public health risk,” and cite the government health statistics of illnesses to back up their assertions. The International Dairy Foods Association “represents the nation’s dairy manufacturing and marketing industries and their suppliers with a membership of nearly 525 companies within a $125-billion-a-year industry,” according to its website. 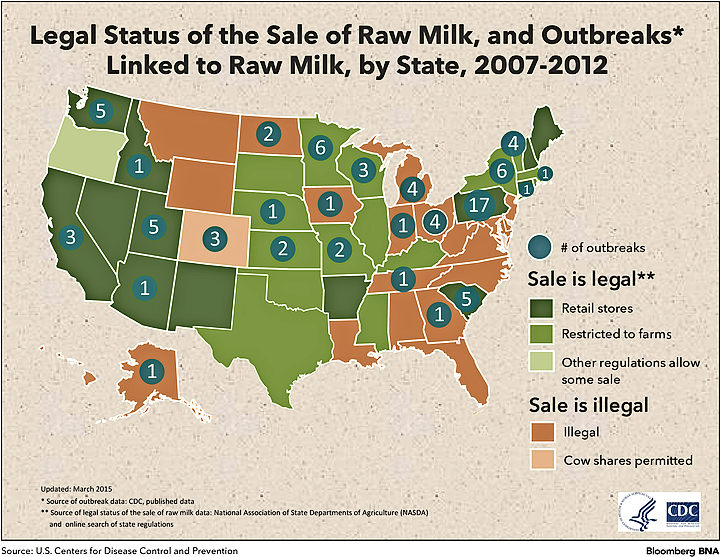 States that permit direct farm-to-consumer sales usually require a notice to buyers of the health risks of raw milk. A bill pending in North Dakota, for example, includes a provision that the buyer “assumes the inherent risks” and is “legally responsible” for any property damage, personal injuries, or deaths that may result.Legislation pending in Rhode Island would make that state the latest to permit retail raw milk sales. The Rhode Island bill would mandate a posted sign telling purchasers that raw milk “may be harmful to human health.”But warning labels only go so far when an outbreak occurs, the plaintiffs’ lawyers said.“Typically, in foodborne illness cases, if you have an adulterated product, whether it is natural or pasteurized or anything else, you’re on the hook,” said Pritzker.A jury could decide an adult sickened by raw milk, but who had been advised of the dangers at the time of purchase, could be held partly at fault in a personal injury action, both Pritzker and Marler said.But that calculus changes when an injured child—the typical client in raw milk cases—knew nothing of the dangers.“They usually are children who developed acute kidney failure,” said Marler. “Having a label doesn’t absolve a manufacturer from liability.”Jay-Russell noted the blurred lines among state politicians. “It’s a bit of an irony that while we see more children getting sick, we see more lawmakers wanting to provide access for their constituents, who are very passionate,” she said. Some of those constituents, too, are behind a citizen petition filed in April that would have the FDA expand raw milk sales on a national scale. Easing the long-standing federal ban on interstate sales of raw milk would aid farmers and further the Trump administration’s goal of “reducing regulatory burdens,” according to the petition of the newly-formed Real Food Consumer Coalition.The interstate prohibition “imposes a disproportionate and draconian punishment of criminal prosecution against Amish farmers and others in the Hispanic community who depend on unpasteurized milk and cheese as an ethnic dietary staple,” lawyer Jonathan Emord, of Emord & Associates in Clifton, Va., who filed the petition, told Bloomberg BNA.Emord said the label proposed for interstate raw milk sales is more than that required of other foods in interstate commerce. “Note well that comparable notices are remarkably not present on the labels of commercially pasteurized milk and cheese products—or on sushi, sushemi, eggs, raw meats—despite the pathogenic risks associated with those products commonly arising from inadequate refrigeration in transport, commercial holding, and customer use,” Emord said in an email.For Galen, of the milk producers federation, the question comes down to protecting consumers before any sale is made.“A lot of this is driven by economics, but from where we sit, the economics should not trump the public good and the public health,” Galen said.